Tendons are strong, rope-like structures that connect muscles to bones, and allow you to move your toes, feet, and ankles in different directions. In the foot, many tendons and muscles are required to allow you to walk. These tendons must push against the entire weight of the body almost constantly while you are standing or walking. While running, tendons push against several times body weight. For this reason, tendons in the foot and ankle are prone to developing tendonitis (inflammation of the tendons), partial tears, and in the case of the Achilles tendon, complete rupture. Without proper healing of an Achilles tear, a person’s ability to walk, jog, jump, and perform other high impact activity will be limited. A tear can be treated either with casting or with surgical repair. Cast treatment requires 6-8 weeks of non-weight bearing cast immobilization, followed by several weeks in a walking boot, to make sure the tendon is completely healed in proper position. Surgical repair of an Achilles can usually be performed through a small (3/4”) incision, and requires just 3-4 weeks non-weight bearing and an additional 2-3 weeks in a walking boot. Surgery results in a much quicker recovery and return to regular activities than non-operative treatment, and a slightly lower rate of re-rupturing the tendon. However, most studies show that at 1 year following the injury, functional results of cast treatment and surgical repair are about equal. The Achilles tendon is the largest and most common tendon to develop inflammation in the foot and ankle. Achilles tendonitis causes pain either at the site where the Achilles attaches to the calcaneus (insertional), or about 2 inches above this point (non-insertional). The pain commonly occurs when first getting up from sitting or sleeping, or when beginning vigorous activity. Once the tendon warms up, the pain often decreases. It is common to develop bone spurs where the Achilles tendon attaches to the heel bone, or thickening of the Achilles tendon itself 2 inches above the heel bone. Initial treatment of Achilles tendonitis involves avoiding painful activities, appropriate stretching exercises, and icing and anti-inflammatory agents to combat the inflammation. If these measures are not helpful, a period of 4 to 6 weeks of immobilization in a walking cast is usually recommended. In patients with non-insertional Achilles tendonitis, some studies have showed than an injection with Platelet-rich plasma (see website entry under “Regernative Medicine) can eliminate the symptoms and swelling. In cases of Achilles tendoninits that have not improved ater 6 months of conservative treatment, surgery may be recommended. During surgery, the damaged portion of the tendon is removed. If a large portion of the achilles is damaged, it may need to be replaced or reinforced with another tendon located next to the Achilles (known as a tendon transfer). If there are any bone spurs on the calcaneus, these are removed during surgery. Full recovery from Achilles tendon reconstructive surgery is between 3 and 6 months, depending on the extent of damage to the Achilles. The posterior tibial tendon stretches across the inner portion of the ankle and attaches to the middle part of the foot. This tendon is a major support structure of the arch of your foot. In earlier stages, pain and swelling occurs over the inner portion of your ankle. In advanced stages of posterior tibial tendonitis, your arch collapses, your foot flattens, and the heel bone may jut towards the outside. Posterior tibial tendonitis is usually treated with immobilization in a walking cast for 4 to 6 weeks. The cast is usually followed by a type of brace which allows ankle motion but supports the arch. Long-term treatment may require a specially made ankle brace to hold your ankle stiff while walking. In cases of posterior tibial tendonitis that doesn’t improve with conservative measures, or in people who do not want to use a large brace all of the time, surgery may be recommended. The damaged tendon is removed in its entirety, and replaced with a tendon that sits adjacent to it. If the arch has begun to collapse, the heel bone will be cut and shifted inwards to offset the collapse. In longstanding cases of a collapsed arch, a fusion surgery may be necessary to correct the deformity (see arthritis section). Full recovery from posterior tibial tendon reconstruction is between 4 and 6 months, depending on the type of surgery performed. The 2 peroneal tendons are located over the outer part of the ankle, and run behind the fibula bone (the outer ankle bone). They enable you to pull your foot and ankle out to the side. In addition to inflammation (tendonitis), the peroneal tendons are prone to developing tears, or dislocating from behind the fibula. Once pain and swelling have developed over the peroneal tendons, there is often a tear present. Initial treatment for peroneal tendonitis consists of immobilization in a walking cast for 4 to 6 weeks. If the symptoms don’t improve, an MRI scan is usually indicated, to assess for a tear of the tendons. Surgery is necessary if a tear is identified or suspected. Peroneal tendon dislocation is characterized by a distinct sensation that the tendon is slipping out of place. 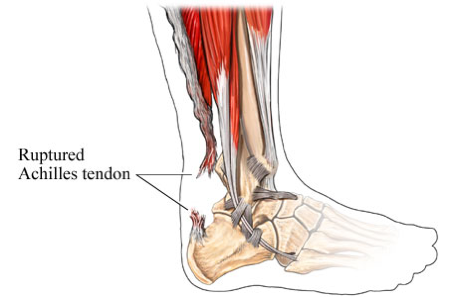 Usually there has been an identifiable injury, such as a severe twisting to the ankle, that damaged the tendon sheath that holds the tendons in place. Cast immobilization within 2 to 3 weeks of the injury may help to fix the problem. If the dislocations have been going on for longer, then surgical repair of the tendon sheath is necessary to hold the tendon in place.